Well deserved 1st place @ 2015 Futurity! Miss Accoyo la Perla is a lovely milky color, like her namesake the pearl. 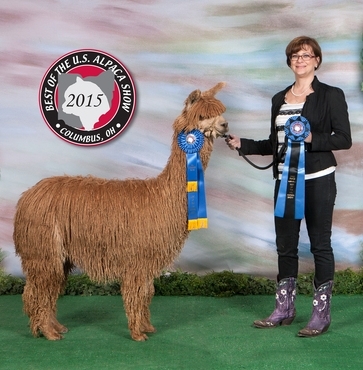 Her thick soft fleece, which earned her a Color Championship at the 2013 IAO Fleece Show, practically begs to be touched. 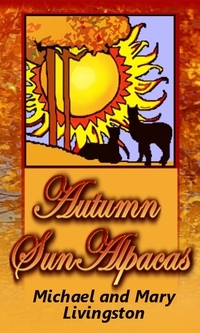 She is pregnant with her first cria, due in late June of 2013. 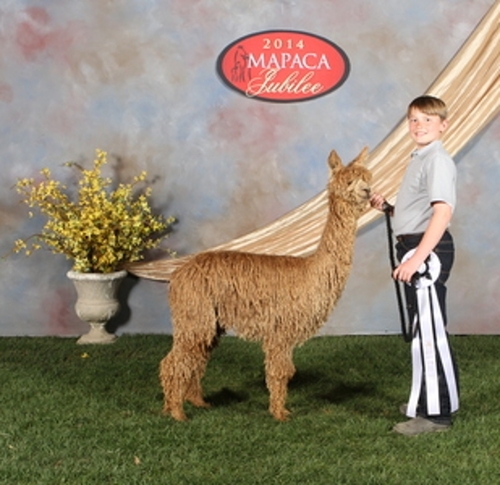 In the making of La Perla, we dipped into some of the finest genetics that Park View Alpacas has to offer. This is not surprising when you consider Laszlo's lineage. He is sired by the incomparable Chakotah's Wyuna, in turn the son of Chakotah, son of Kahuna. These males are the examples of the elite males from Pucara that builds Laszlo's pedigree. 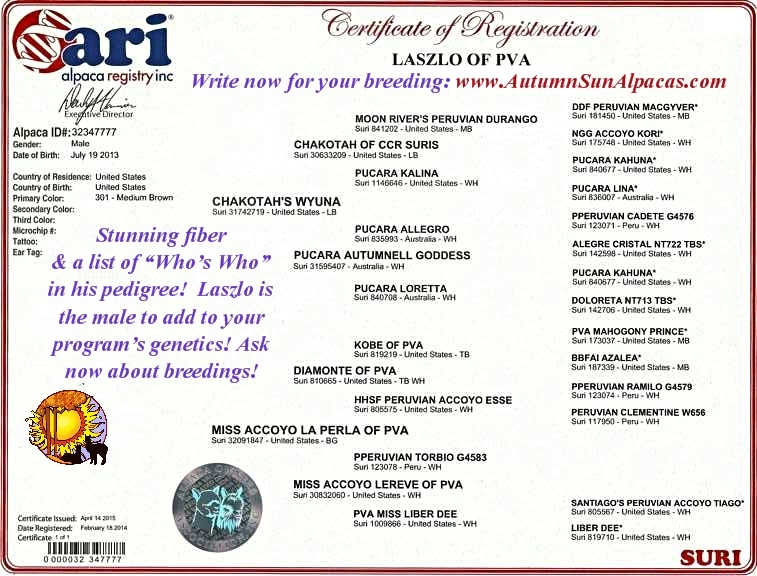 Both Chakotah and Kahuna, and now Wyuna, are pivotal males in the suri industry with several Get of Sire and Herdsire of the Year awards among them. 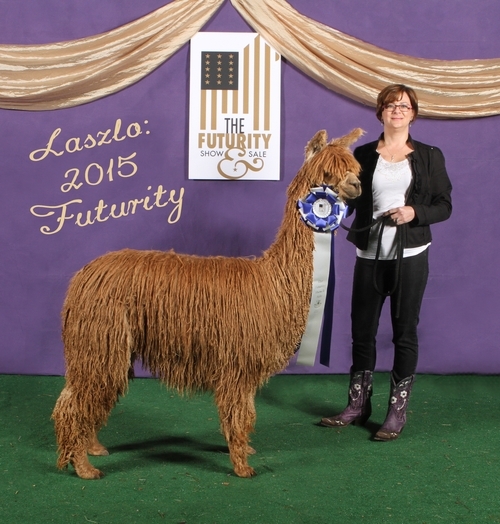 From this, Laszlo has an excellent cornerstone in his pedigree to solidly leverage any breeding program. 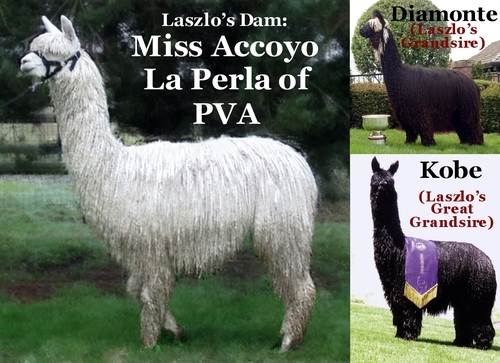 If that was not enough, Laszlo's dam is Miss Accoyo La Perla of PVA and is from Park View's breeding program -- whose monumental strides in the alpaca business are felt at farms across the nation. Her dam is the daughter of black champion herdsire Diamonte of PVA, who is the son of Kobe of PVA. Again, both males have been instrumental in shaping the suri industry, especially with consideration to dark and black colors, and remain active in breeding programs today. 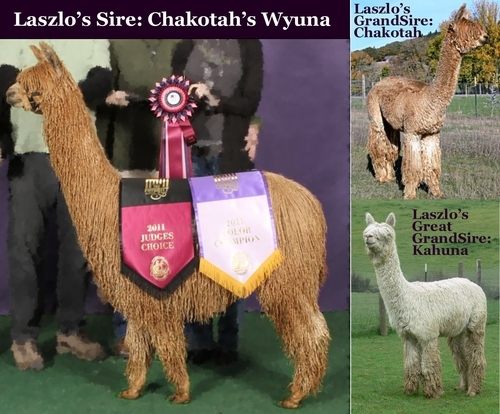 Laszlo was not one to shirk the show ring expectations his heritage demanded. 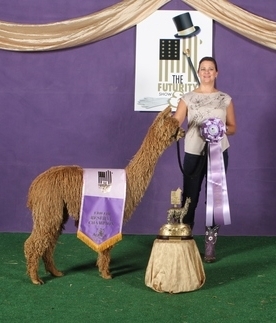 He has demonstrated his inheritance by a significant gathering of show ribbons, to include more than one champion and/or special Judge's selection placings. This is just the first step in this male's career, as we expect his confident and proud nature to translate easily into his breeding stud service this summer and fall. We are offering a select number of very affordably priced breedings for those who want to join us proving him out this year! We will also take 10% off his already low introductory breeding fee for packages of 2 or more breedings. We expect great things from this herdsire! Breedings to Laszlo can be financed up to a year with tailored contracts to fit your needs!